rope dart is from the Tang Dynasty (618-907 AD). 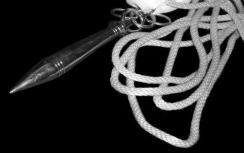 rope, the dart and the silk. overly thick, else the rope will be sluggish to react. Darts are available in many shapes and weights. larger the silk must be. regarded weapons in the Chinese Martial Arts. size, shape or martial arts experience. Dart, the Kung Fu Weapon. discernable and the instruction just as clear. anyone interested in learning the rope dart. had never taught the rope dart at the school.